As mayors from around the nation gathered in San Francisco this week for their Annual Meeting #usmc2015, the City by the Bay announced a plan to reduce pedestrian and bicyclist deaths. San Francisco has been a leader in urban transportation initiatives, particularly where safety is concerned. But in spite of this, pedestrian and bicyclist deaths have been on the rise in recent years. San Francisco’s new plan includes restrictions for passenger vehicle turns on Market Street starting in August. Market Street is a notorious hotspot for bicycle and pedestrian fatalities due to the complexity of the angled intersection of SOMA with the Financial District, high traffic levels, multi-modal traffic, and high levels of driver distraction. 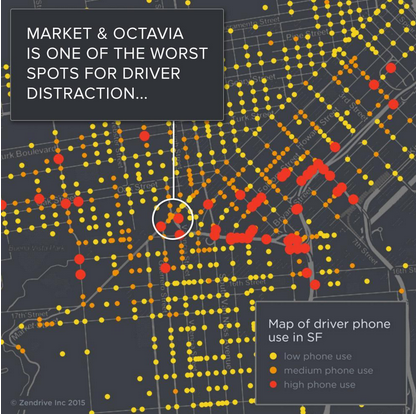 Indeed, a recent study by Zendrive found that Market Street is a very dangerous route and, particularly, that the Market & Octavia section is one of the worst spots for driver distraction on Market Street. In fact, Zendrive’s analysis shows that reducing Market Street access could exacerbate the problem for cyclists on the Folsom and Harrison corridors as Market Street traffic is shunted south. According to Zendrive, whose mission is to make all driving safer using data and analytics, redirecting traffic will only get us so far. “To achieve Vision Zero by 2024 the city needs to get serious about phone use and speeding, particularly in heavily commuted cycling routes. And the only way to do this in a resource efficient and effective manner is analyzing actual data about driving behavior, which is Zendrive’s expertise,” Matus said. To support the Vision Zero effort, Zendrive today announced it will make available free of charge its technology and insights to San Francisco, and all other cities participating in the Vision Zero initiative, to use with their fleets.